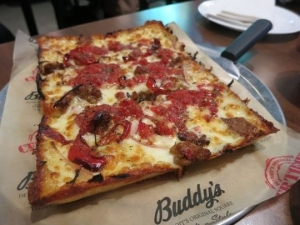 If you’ve ever lived or visited the Detroit area you’re probably very familiar with Buddy’s Pizza. According to Mlive.com, Buddy’s Pizza plans to open up on 28th Street SE, at the former site of Carrabba’s Italian Grill, sometime this Spring. Buddy’s Pizza is know for their deep dish pizza, and let me tell you from experience, it’s delicious. We used to go there all the time. As a matter of fact my husband and I held our wedding rehearsal dinner at Buddy’s Pizza. Hey, what’s better than pizza and beer? Welcome Buddy’s Pizza.